It still suffers some unusual chassis tremors and body pitch-and-roll over anything but smooth pavement, but the Wrangler’s stone-age, solid-axle suspension has been improved to the point that the ride is no longer a deal-breaker for those smitten by the Jeep bug. The interior has likewise been improved with nicer materials, some handy storage space, and decent control ergonomics, and these, too, are no reason to pass this highly capable off-roader by as daily transportation. Fuel economy isn’t great but isn’t as dismal as it once was, and the 3.6-liter V6 makes plenty of power. Our tester was fitted with the soft top, but unless you’re willing to invest lots of time in taking it down (and far more in putting it back up) or can just leave it down for long stretches, the hard top with its removable roof panels seems a wiser choice. While there remain few logical reasons for buying a Wrangler over more conventional compact or midsize SUVs, there are certainly emotional ones. And I can think of few better “backup” vehicles than one you can open to the breeze in the summer yet will forge through piled snow in the winter. Having owned a CJ-7, I must confess to being afflicted with the “Jeep Bug” described above by Rick. And because of my disease, I completely understand why someone would want to own a Wrangler. That said, I sincerely hope folks buying Wranglers, even the four-door Unlimited versions, aren’t using them as daily commuters. For better fuel economy, a much better ride, and a much classier cabin, move over to the Grand Cherokee. True, the Wrangler is ultimately better equipped to handle what nature may throw your way, but I don’t want to know the snow storm (or flood, or whatever) that a Wrangler can handle but a Grand Cherokee cannot. I was delighted that our test car can with the soft top, as the weather was especially conducive to open-air cruising the days our Jeep was on hand. What I found was lowering the top was a five-to-six-minute process, but returning it to its upright position is far more complicated and should include the assistance of a patient friend. Most of the trouble comes from zippering in the plastic rear-quarter window pieces. As Rick suggested, enjoying a Wrangler top down probably means leaving the top down for as long as you can. With the top down, driving the Wrangler is a blast. The commanding seating position and open air experience is one rivaled by few other new vehicles. I must note that with its padded rollover bars the four-door Wrangler Unlimited does not feel quite as open as its two-door stable mate. I expect removing the doors would go some distance towards correcting this, but I did not get around to doing so. That said, the process is not that complicated, but, again, a helpful friend and assistant would be handy. The big surprise for me was fuel economy. Previous editions of the Wrangler powered by the old-school 3.8-liter V6 were thirsty things, sucking fuel at a 13-15 mpg rate. The now-standard and only engine, the 3.6-liter “Pentastar” V6 is a much thriftier mill, returning more than 18 mpg in our care, with plenty of power, to boot. 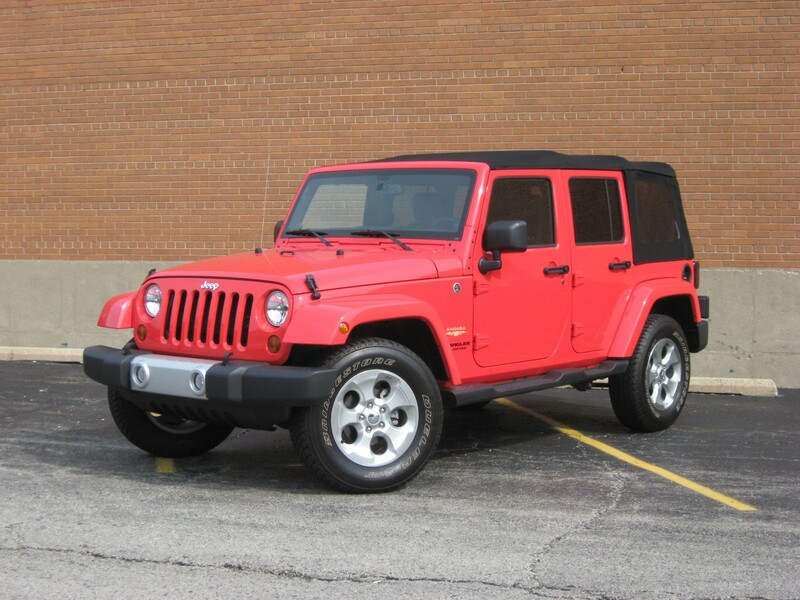 If you have regular need for the kind of all-terrain prowess the Wrangler Unlimited affords, I envy your lifestyle. Or, if you have space in your garage for an awesome go-anywhere weekend convertible, I also envy you. Jeep has done a commendable job of keeping this American icon’s character in line with its heritage, and the result is a vehicle that is a joy to drive off-road, on road with the top removed, or through the occasional life-threatening winter snow event. Written by: The Daily Drive staff on August 28, 2013.on March 22, 2019.